QUARTER-FINAL REVIEW: Frisch Auf Göppingen and Saint-Raphael Var Handball clinch last Ottostadt Magdeburg EHF Cup Final berths. On Sunday, Frisch Auf Göppingen and Saint-Raphael Var Handball booked the last two tickets to the Ottostadt Magdeburg EHF Cup Finals, for which the draw will take place on Wednesday at 11am in Germany. Having won the first leg against Chambery Savoie Mont Blanc Handball, Göppingen were also victorious in the second, while Saint-Raphael could afford their 10-goal away defeat to Fraikin BM. Granollers after winning the first leg by 14. 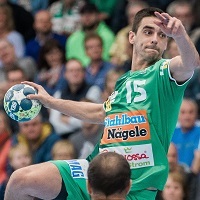 Frisch Auf Göppingen may still hope to win the Men’s EHF Cup for the third time in a row, as the German team are ready for the EHF Cup Finals after winning the second-leg quarter-final against Chambery on Sunday. Göppingen were in control throughout the 60 minutes in EWS Arena. After starting with a 3:0 lead, they went on to five-goal advantages at 7:2 and 8:3. Though the visitors managed to reduce the gap for parts of the first half, Göppingen were still five goals ahead at half-time. In the second period, the Bundesliga team reached their biggest lead at 22:15, and even though Chambery reduced the deficit to two goals at 26:24 with 10 minutes left, Göppingen’s aggregate win was never in real danger. Saint-Raphael became the last team to enter the bowl for Tuesday’s draw in Magdeburg, and could even afford a clear defeat in Spain on Sunday night. Saint-Raphael’s 14-goal win at home in the first leg had reduced the return match to something of a formality. However, at the start, the visitors seemed determined to remove any lingering doubts, as they opened the match by taking a 4:1 lead. But Granollers managed to show that they meant business. Through strong defence and seven-against-six tactics in attack, the Spanish side pulled in front 14:11 in the first half. After a narrow one-goal lead at half-time, the home team outran their opponents in the second half. Granollers increased their lead constantly throughout the last 30 minutes, reaching a score line of 11 goals at its peak. But with less than one minute left, this decisive advantage came too late to create any doubt about the overall result. Saint-Raphael are ready for their second EHF Cup Finals berth in succession, while Granollers will have to find consolation in saying goodbye to the competition in style.